If we take a closer look , it is not very difficult to understand why this is the case. Firstly Beauty Industry in India is Rs 12,000 Cr. Industry and it is the fastest growing industry in India at the rate of 30%. Such high growth rate means plenty of job opportunities. #4) Start your own business: Starting your own business in beauty is perhaps one of the easiest business . It requires low investment and money normally would start coming right from first day onwards. 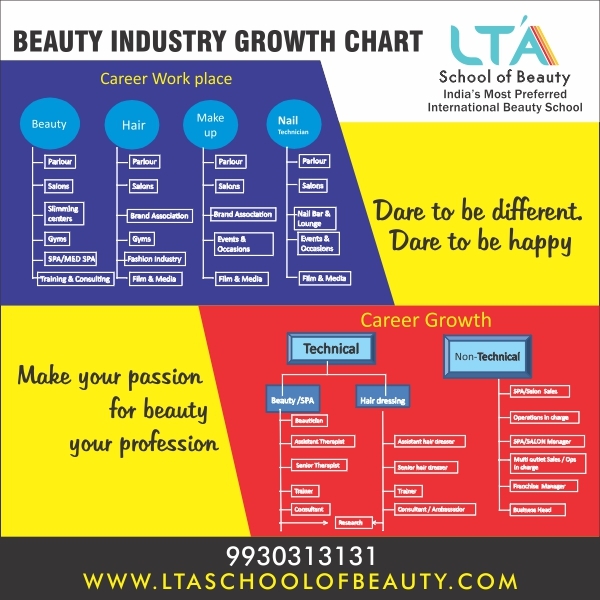 i) First step is to identify a good beauty training school which has good training facility, qualified trainers, Accreditation from reputed body and has good ethics along with sound safety and hygiene standard . iii)Learn to improve your communication and presentation skill: A well groomed beauty therapist/cosmetologist or a hair dresser along with good communication skills is a big asset to the company as they would be able to understand client better , build better rapport with clients and be in a position to explain why a particular treatment/style has been recommended. This would help n gaining client confidence and ensure the client would come back to you month on month for years together. iv) Get certified: It is equally important that you get certified by a reputed body preferably by body whose certification is accepted worldwide. Such certification would help you get jobs not only in India but also any where in the world. Getting International certification is like getting your PASSPORT FOR AN INTERNATIONAL CAREER IN BEAUTY AND HAIR INDUSTRY. IF YOUSTART RIGHT. YOU WILL END RIGHT.